At The McGriff Alliance, we believe that each of us shares a dream that our time here on earth will mean something, and that we will be able to positively impact the world around us. Many of us want to also protect, strengthen and unify our families. For most people, the path to accomplishing these objectives has meant creating and accumulating financial assets and resources. 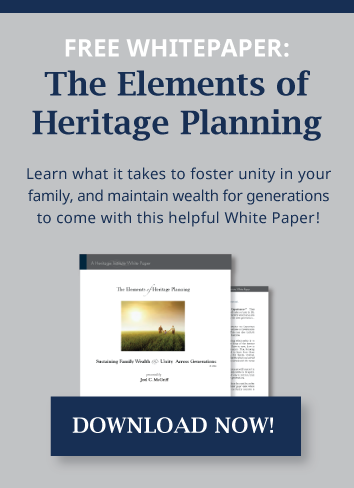 While assets and resources are important, the fact is that when the foundations of truly significant legacies are studied by the experts, it is clear that lasting legacies are more a product of the values by which we live, rather than the money we earn and pass along to our heirs. It is our passion to help our clients and their families identify, design for and achieve what matters most to them. We want to know what you would like to achieve today and for generations to come, and to then guide you on a personalized path to let you realize that dream. We promise that this conversation with us will be unlike any you have had with any other financial advisor… and that your results can rise beyond your expectations.